Our third edition of Arts & Crafts found us at Ravenswood's Designscout studio where we learned the art of hand lettering with Frances MacLeod. The night kicked off with a short presentation from Frances where she gave us the basics on hand lettering before letting us loose to try it ourselves. For those that needed a little liquid inspiration, Ale Syndicate's Richie Imperial Porter and Paulina Wit were flowing freely. 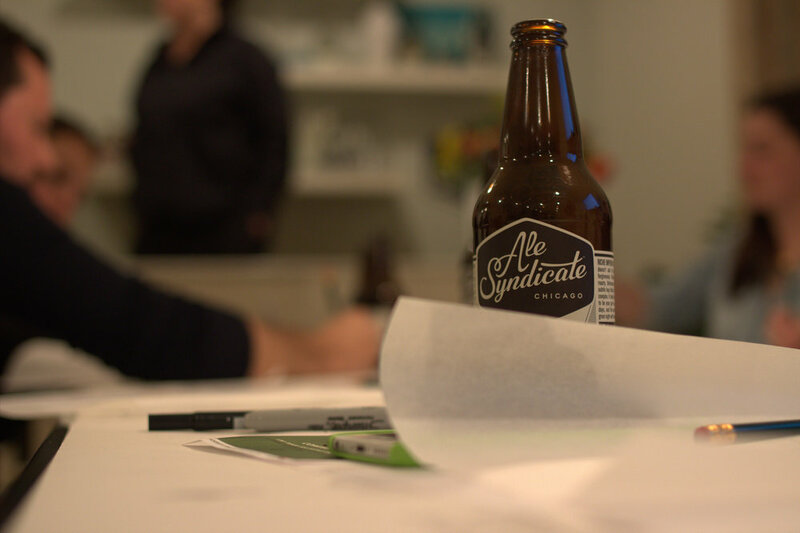 By the end of the night, everyone had a few designs they could take home and don't be surprised if you see those designs on your favorite craft beers! Thank you to all those who helped put on this event and a huge thanks to everyone who came out for a night of Arts & Crafts. If you're interested in learning more about the next iteration of Arts & Crafts, sign up for our newsletter for the latest information. Check out the images below for a taste of what Arts & Crafts is all about.